UNESCO Director-General Irina Bokova addressed today’s Plenary Meeting of the UN General Assembly, which adopted unanimously a resolution on “Saving the cultural heritage of Iraq”. The resolution, presented jointly by Germany and Iraq, was cosponsored by a total of 91 Member States, focuses on the fight against the destruction of cultural heritage and attacks against the cultural diversity in Iraq. “The deliberate destruction of cultural heritage is a war crime – it is used as a tactic of war, in a strategy of cultural cleansing that calls on us to review and renew the means by which we wish to respond and to defeat violent extremism,” declared the Director-General. “The adoption of this resolution marks a turning point in the mobilization of the international community” she continued. “The resolution resonates deeply with UNESCO’s mandate and I am here to reaffirm UNESCO’s unwavering determination to live up to its responsibilities with regard to its mandate for the protection and preservation of cultural heritage worldwide and to support Member States in this endeavor”. UN Deputy Secretary-General Jan Eliasson, speaking on the adoption of the resolution “with a deep sense of serious and historic responsibility”, stated that “the destruction of cultural heritage bears witness to a form of violent extremism that seeks to destroy the present, past and future of human civilization”. He commended UNESCO and its partners for assisting Member States’ efforts in dealing with this new global problem. The resolution was introduced by Ms Maria Böhmer, Minister of State at the Federal Foreign Office of Germany and Ambassador Mohamed Ali Alhakim, Permanent Representative of Iraq to the United Nations. “The attacks on the cultural heritage of Iraq are a test case for all of us. Iraq is a cradle of our common civilization… Its heritage has been entrusted to the care of all of mankind. The international community must do all it can to put an end to these war crimes” said State Minister Böhmer. “The destruction of cultural heritage aims to erase the multicultural history of Iraq that has been the hallmark of our country” stated Ambassador Alhakim. The resolution contains a strong call to fight the impunity of perpetrators of attacks against cultural heritage and encourages all Member States to ratify the Rome Statute of the International Criminal Court to ensure that the intentional destruction of cultural heritage may be prosecuted as a war crime. It highlights also UNESCO’s#Unite4Heritage social media campaign and calls on UNESCO to assist Member States in the implementation of Security Council resolution 2199. 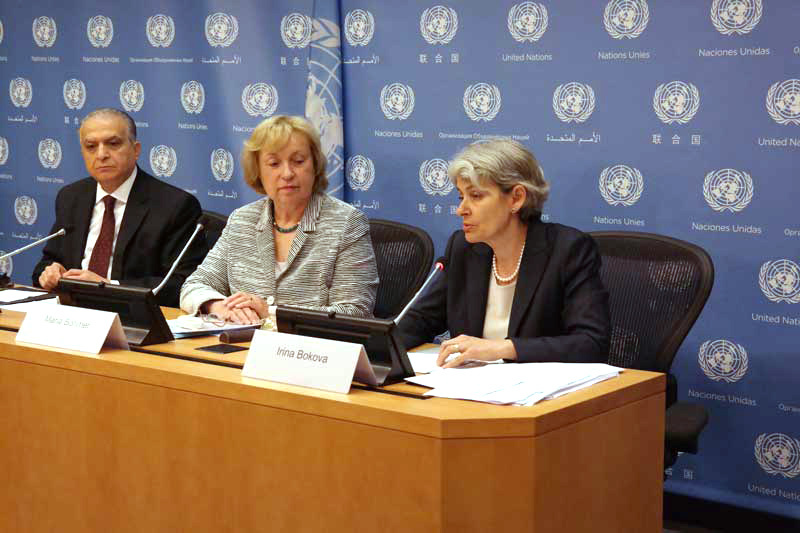 The plenary debate was followed by a joint press conference of State Minister Maria Böhmer, Ambassador Mohamed Ali Alhakim, and UNESCO Director-General Irina Bokova.